With four local ferry services to choose from, cruising the waters of Vineyard Sound from Falmouth to Martha’s Vineyard, is fast and easy. THE ISLAND QUEEN, the only cruise ship that sails from Falmouth Harbor directly into Oak Bluffs, is a seasonal ferry service. For complete schedule of sailings to and from Oak Bluffs, visit islandqueen.com or call 508-548-4800. Parking available near the dock. 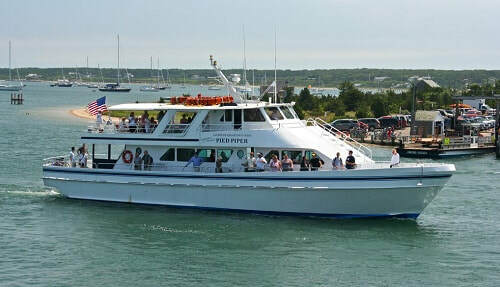 THE FALMOUTH-EDGARTOWN FERRY, The M/V Pied Piper, their 72 foot luxury fast ferry, a seasonal service, is the only ship sailing directly from Falmouth Harbor to Edgartown. For complete schedule to and from Edgartown, visit falmouthedgartownferry.com or call 508-548-9400. THE STEAMSHIP AUTHORITY, Falmouth’s only year-round ferry service, sails into both Oak Bluffs (seasonally) and Vineyard Haven on Martha’s Vineyard. With sailings almost every hour from the village of Woods Hole, visit steamshipauthority.com or call 508-477-8600 for complete schedule. Park conveniently in Falmouth and take the free shuttle to Woods Hole. The Steamship Authority is the only service that provides car transport and reservations are required Friday, Saturday, Sunday and Monday. For travel to Nantucket the Steamship Authority sails out of Hyannis Harbor. HY-LINE CRUISES Hop aboard their High-Speed Ferries to Nantucket and Martha’s Vineyard from Hyannis, the only mid-Cape departure point to both islands. High-Speed is fast, easy and fun! Hy-Line’s exclusive “Around the Sound” seasonal cruise allows you to visit BOTH islands in the same day for a full day of sightseeing, cruising, shopping and island hopping. The Inter Island Ferry provides high-speed ferry service between the islands for visitors who want to "Island Hop" for the day or overnight. 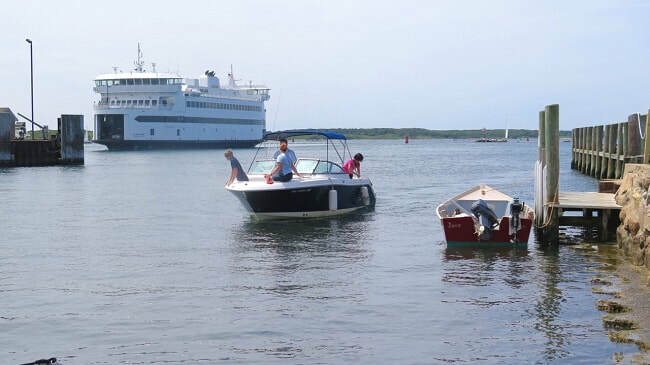 Hy-Line also has cruises available for deep sea fishing, and tours of Hyannis Harbor and the Cape Cod Canal. For complete schedule to and from The Islands, visit hylinecruises.com or call 800-492-8082. THE STEAMSHIP AUTHORITY When Nantucket is your destination, they offer two options from Hyannis. Travel in style aboard the seasonal, high-speed, M/V Iyanough, which gets you there in an hour. High-speed passenger reservations are recommended and can be booked online, by calling 508-495-FAST, or in person at the terminals. Or take a leisurely 2 hour and 15 minute ride on one of their traditional ferries. Passengers traveling without a vehicle on the traditional ferries may purchase tickets at the terminals on the day of sailing. Advance vehicle reservations are required and can be booked online, by phone, or in person at the Hyannis and Nantucket terminals. For complete schedule, visit steamshipauthority.com or call 508-477-8600.